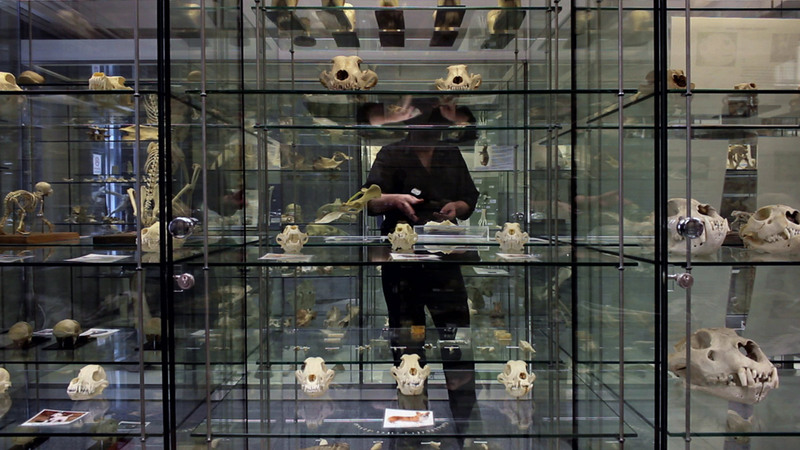 HOST II This video was filmed at the Anatomy Museum of the Royal Veterinary College, London. The viewer is witness to an intimate encounter between myself and the specimens contained in the glass display cases throughout the museum – mostly animal, some human. Whilst turning my body in a clockwise motion I softly recite a 100-word text written specifically for the occasion: the text, engraved on ordinary razorblades (one word per blade), addresses the relationship between my body as a meaty living thing, and the stripped-down specimens on display. For me, this is a deeply violent encounter with the humanist systems of studying, classifying and displaying the fruits of its labour. My body is fragmented into multiple reflections that take on a life of their own: Initially these reflections duly follow the central figure’s movement. But, as the action progressively unfolds, the two reflections on the side go completely out of sync until, as if by magic, they all complete the performance at exactly the same time. The ‘words’ produce sound as each blade is thrown against the various material surfaces that surround me. Also see the work ‘Host 1’ (2010) filed under the ‘Performance’ section.